For a surf school easy access and good facilities are essential. The parking comes easy, the fresh water showers are crucial, and black ball is nonexistent here. Located in Huntington Beach, ten minutes North of Main street. Being close to downtown Huntington Beach, yet not in the center of it all makes it a less touristic spot. Also, the location provides easy access from the 405 freeway. The adults taking private surf lessons and the kids attending summer surf camp don’t have to fight for waves and there is plenty of space on the beach. Being close to Main Street in Huntington Beach provides many options for shopping and food nearby. Unlike the rest of the crowded beaches, parking is not an issue. Away from the Huntington Beach pier and Main Street makes it easier to find parking with less tourists. It has a massive parking lot with many spots. The facilities at Bolsa Chica State Beach provide hot/cold showers and clean private bathrooms. After a salty day in the water there’s nothing like being able to take a fresh water shower. Allowing the parents and kids to get the sand and salt off before heading home or to Pacific City for a fun afternoon of shopping and dining. 3-mile stretch of sandy beach along the famous Pacific Coast Highway. The 3-mile stretch of beach allows for a nice place to spend the day with the family. Come watch the students surf, while enjoying the surf and sun. Also, lifeguards are on duty during the summer months. Fun tip – The Pacific Coast Highway goes from Baja, Mexico all the way to the Olympic Peninsula in Washington! 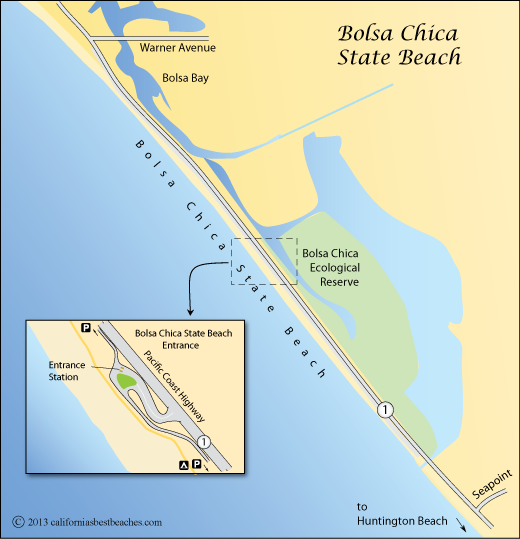 Bolsa Chica State Beach and the surrounding area is a natural adventure. Camping overnight is possible in an RV/Trailer at a designated camping area. It doesn’t get better than camping steps away from the sand overlooking the ocean. On the other side of Pacific Coast Highway is the Bolsa Chica Wetlands where you can stroll on long walking paths, visit the Bolsa Chica Nature Center, or watch the numerous species of birds. The average summer temperatures of the Pacific Ocean in Huntington Beach range in the high 60s, while winter brings slightly cooler water temperatures ranging from the high 50s to low 60s. With the mild water temperatures surfing is possible all year round! Our summers are typically warm enough to surf in boardshorts or a spring wetsuit and the winters are possible to surf in a light full wetsuit, which is the beauty of Southern California. Corky Carroll’s Surf School has both full winter wetsuits and summer spring suits to provide for our guests learning how to surf. To surfers waves are everything, so finding the right wave is necessary for different levels. Corky Carroll’s Surf School chose this beach for the gentle crumbling 3-5 foot waves, ideal for beginners. An ideal beginner wave, offering a long and gentle break that crumbles, not crashes. A wave that crumbles means it is breaking softly and slowly, it has an easier face for beginners to ride. A wave crashing is more powerful and fast, which is more difficult to catch and drop into. The average swell height, wave size, ranges from 3-5 feet year-round. Swell is the collection of waves moving away from a storm in the ocean. This swell as it heads into shallow water at your local beach will make the waves you surf. A small swell size, such as 3-5 feet is a very good size for people learning how to surf. Bolsa Chica’s waves are half the size of anywhere else. Bolsa Chica State Beach faces west, so when the big South swell hits in April through October it is half the size of the beaches surrounding it, such as north of the cliffs through Newport Beach. It is generally considered a longboard wave. The bottom shelf at Bolsa Chica State Beach is shallower than other beaches.This shelf makes the waves smaller than anywhere else, creating calm waters making it a good place to learn how to surf. Bolsa Chica State Beach, the slow rolling shape, generally short paddle, and mostly wide open beach is a great place to learn how to surf. Bolsa Chica State Beach has a sand bottom with small and mushy waves, this combination makes it one of the safest places to learn how to surf. Before going into the water safety in the water is something to learn first. Learning how to paddle out, knowing which way the current is going, protecting yourself from the board, and the stingray shuffle are a few things to learn. The stingray shuffle is shuffling your feet in the sand while in the water instead of taking big steps. The shuffling sends vibrations that scare away stingrays in the immediate vicinity, thus you won’t accidentally step on one. Seeing as though Huntington Beach’s water temperature stays moderate year-round only a light wetsuit is typically needed. Depending on the time of year a wetsuit is important to protect against the elements, such as staying warm in colder water. Corky Carroll’s Surf School provides Ripcurl wetsuits for students learning to surf. Bolsa Chica State Beach is a great spot for longboarders because of the slow rolling waves and longboards are the ideal type to learn on! The right size board is important for beginners, a big board provides more balance and stability. The student is provided a surfboard based on their height and weight. We take pride in our surfboards and getting you started on a real board, no soft-tops here. Unlike the soft-top Costco surfboards, Corky Carroll’s Surf School teaches surfing on high-end hand-shaped surfboards with a traditional concave bottom that provides the same safety of a soft-top surfboard. Less paddling is needed at Bolsa Chica State Beach because the waves aren’t as powerful as other beaches. When beginning this is good because you want to spend your time catching waves not paddling the whole time! Learning how to paddle correctly is important because 90% of surfing is paddling. Starting off with a good paddle technique will help in the long run for getting out past the break. For now it will help with paddling into the waves to surf. Corky Carroll’s Surf School teaches the “4 disciplines of paddling”, 1st: waterline, 2nd: feet together, 3rd shoulders up, and 4th: Stroke. Corky Carroll’s Surf School teaches the 3 steps to standing up: 1st: push-up, 2nd: drive the knee, and 3rd: rotate. 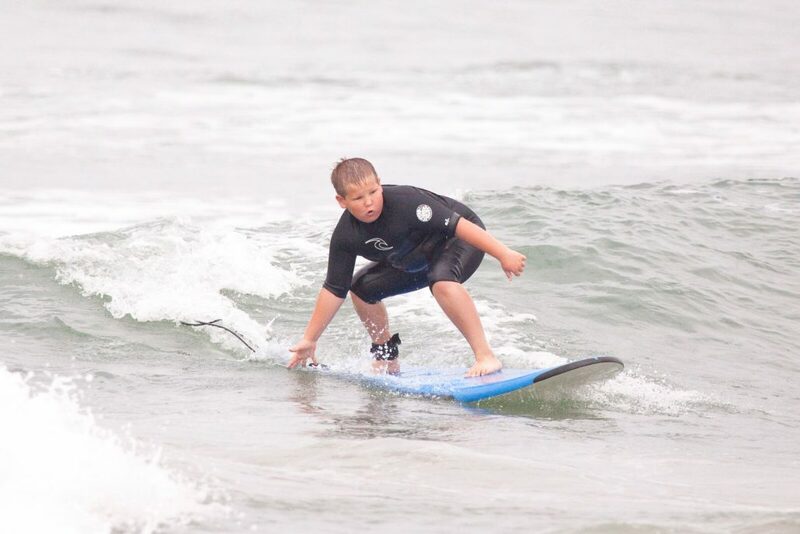 Bolsa Chica’s slow rolling waves and long white water create perfect conditions for implementing the 3-steps to standing up and for all ages learning how to surf. Now that the basics have been discussed it’s time to get in the water. For first timers the inside area is a good place to start in the white wash. 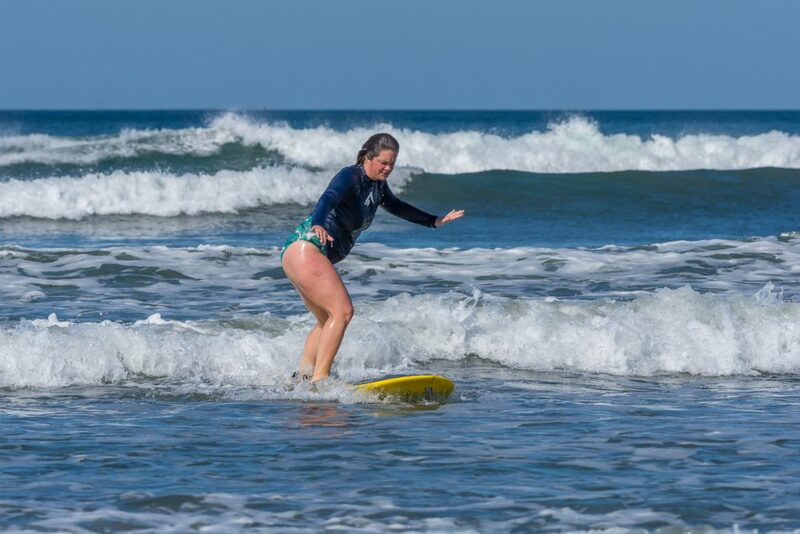 The waves don’t break there, so surfing the mushy white wash can help in learning to paddle and standing up.